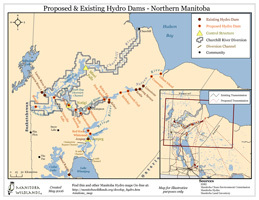 Since the environmental review process for the Wuskwatim projects in northern Manitoba, several new hydro developments are in the planning stages for Manitoba Hydro, and the Premier of Manitoba's preoccupation with "clean" hydropower means Manitobans are increasingly interested in learning about hydroelectric power and issues associated with this type of energy production. 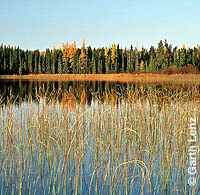 Manitoba Wildlands will be commissioning research into Manitoba's hydro system that is user-friendly and concise. We will provide these documents on this page. 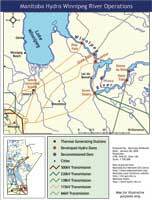 We will also post information from other sources related to hydropower development. 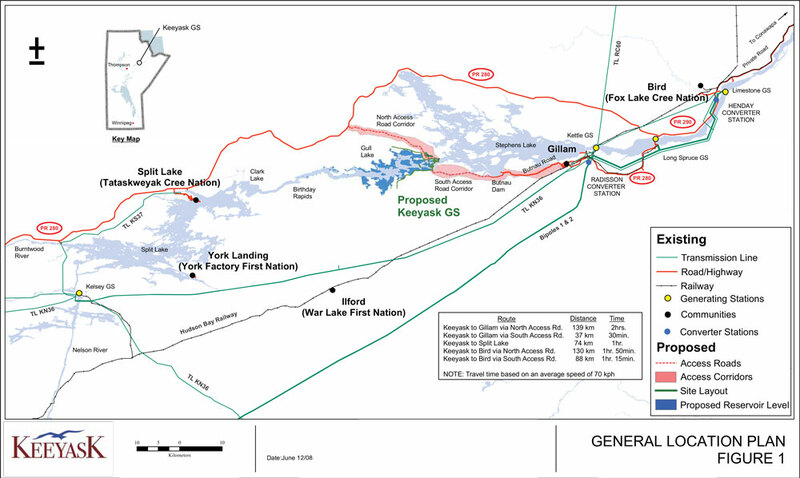 Manitoba Hydro encouraged a review of the planning stage for the Keeyask Generation Station under the IHA (International Hydro Association) sustainability protocol. A team of assessers were in Manitoba in January 2013, including to visit the communities of those First Nations who are business partners in the project. Manitoba Wildlands director, Gaile Whelan Enns was one of only two interviews with civil society organizations undertaken by the assessors. Dozens of other interviews were held with government and hydro personnel. 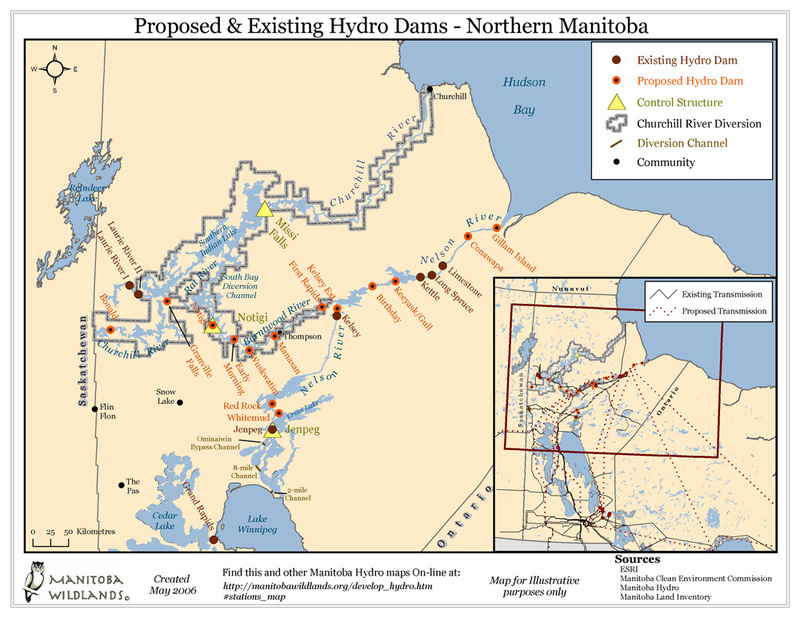 The assessors were uninterested in the Manitoba Hydro system in the province, and one indicated that they knew, " you lost some shoreline a long time ago when the dams were built." Their interest was in securing sign off regarding the environmental impact statements and plans for the generation station. Again, they were not interested in the year long proceedings and hearings from spring 2013 until January 2014 by the CEC, or the regulatory process to review the project. 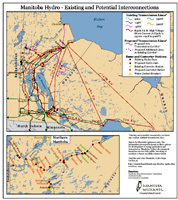 The assessors also were promoting the partnership between Manitoba Hydro and the four First Nations who have options to obtain an equity share in the generation station, despite lack of understanding of the connection between a business partnership and the constitutional rights of Aboriginal peoples in Manitoba. 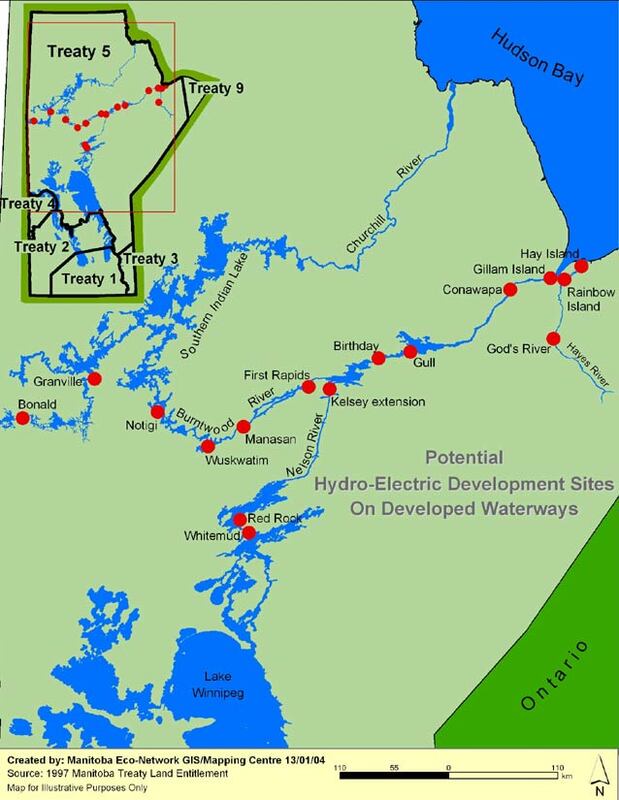 The report from IHA's program was released just before the Winnipeg Clean Environment Hearings for the Keeyask project, and Manitoba Hydro attempted to bring the report in as 'evidence'. 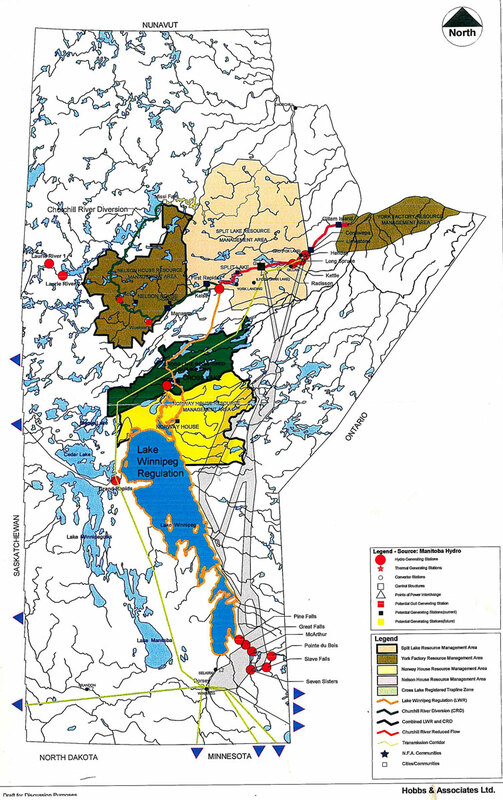 A November 2013 deadline for comments on that sustainability assessment for Keeyask saw little activity, though Manitoba Wildlands posted comments. These comments and the response from Manitoba Hydro, filed in January 2014, are available in the links below. It should be noted that the Keeyask Generation Station CEC hearings record has considerable content regarding sustainability standards and goals for our utility in Manitoba. Much of this expertise advise to the CEC exceeds the standards in the IHA sustainability protocol. 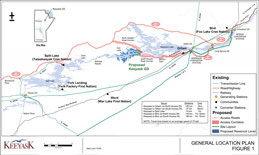 Minnesota Power is proposing to construct a new transmission line running from Winnipeg, Manitoba, to the Mesabi Iron Range, in north eastern Minnesota. 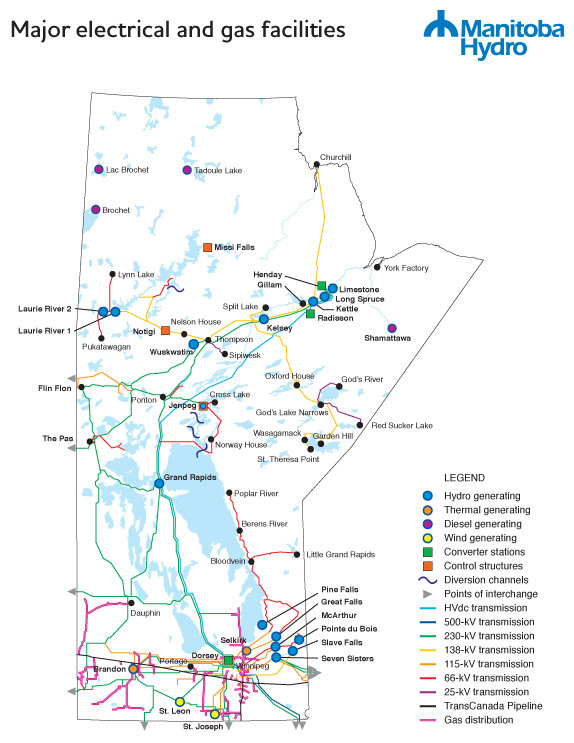 The 500 kilovolt (KV) line - more than double the load first planned - would transport hydro-electric power from northern Manitoba to Minnesota, and potentially Wisconsin and Michigan as well. 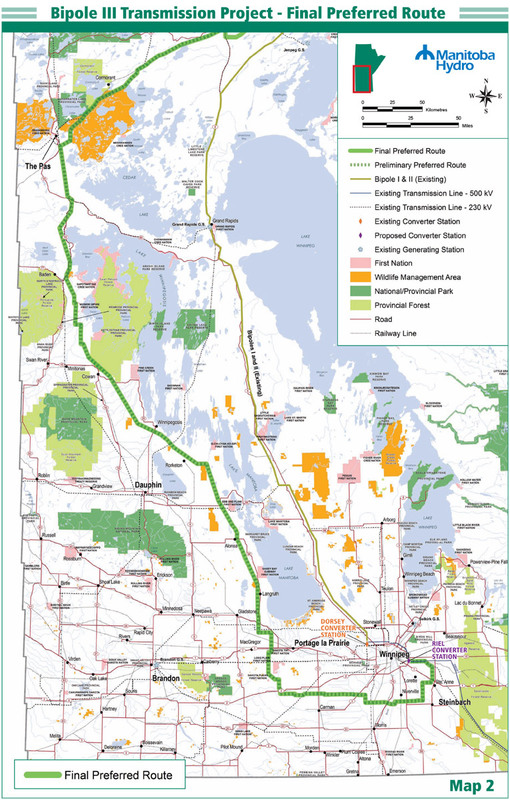 A proposed route and estimated cost for the new line have not been determined. No environmental licenses or construction work permits have been issued. 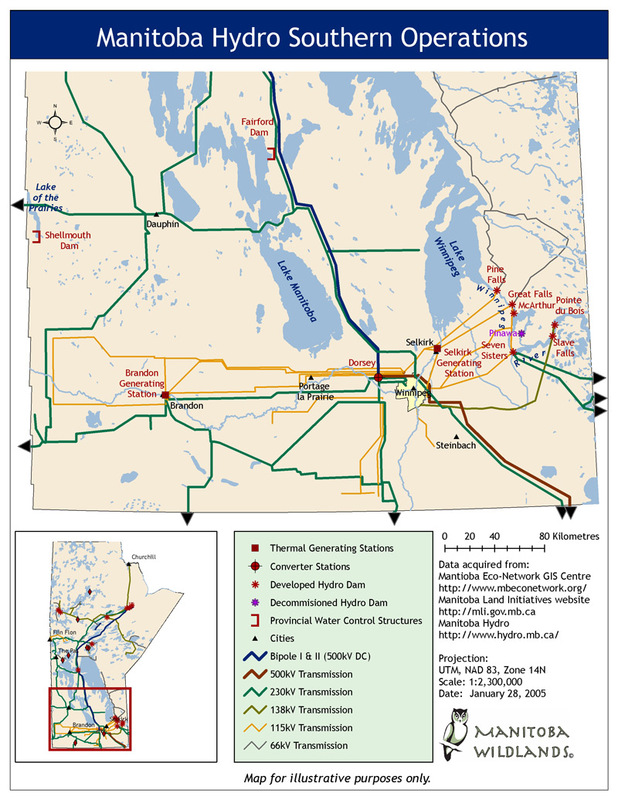 Manitoba Hydro will be responsible for building the line from outside Winnipeg to the U.S. border, and Minnesota Power will be responsible for building the line 340 kilometres to connect to a substation on the Mesabi Iron Range. Minnesota Power has filed its intent to pursue the project through the Midwest Independent Transmission System Operator power group (MISO) for approval. MISO supervises the electrical grid in 11 states and Manitoba. 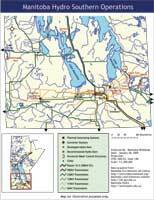 A new 15-year 250 MW power purchase agreement (PPA) beginning 2020 between Minnesota Power and Manitoba Hydro was announced May 25, 2011. The Minnesota Public Utilities Commission approved the PPA January 26, 2012. 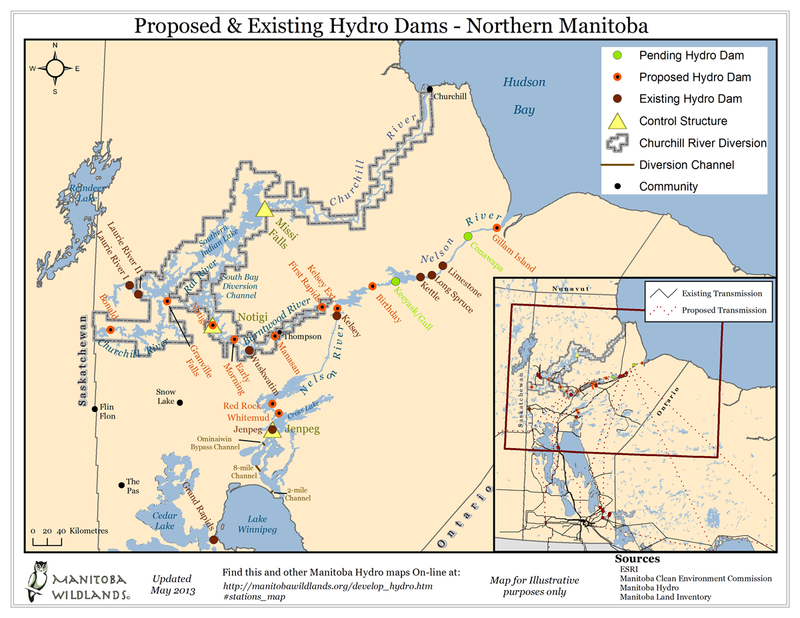 The PPA may require Manitoba Hydro to build new dams in northern Manitoba. A unique aspect of the power purchase agreement is Minnesota Power's ability to "store" wind energy generated in North Dakota in Manitoba Hydro's hydroelectric system. The next phase could see Minnesota Power and American Transmission Co. build a 345 KV line from the Measbi Iron Range to Duluth, MN. 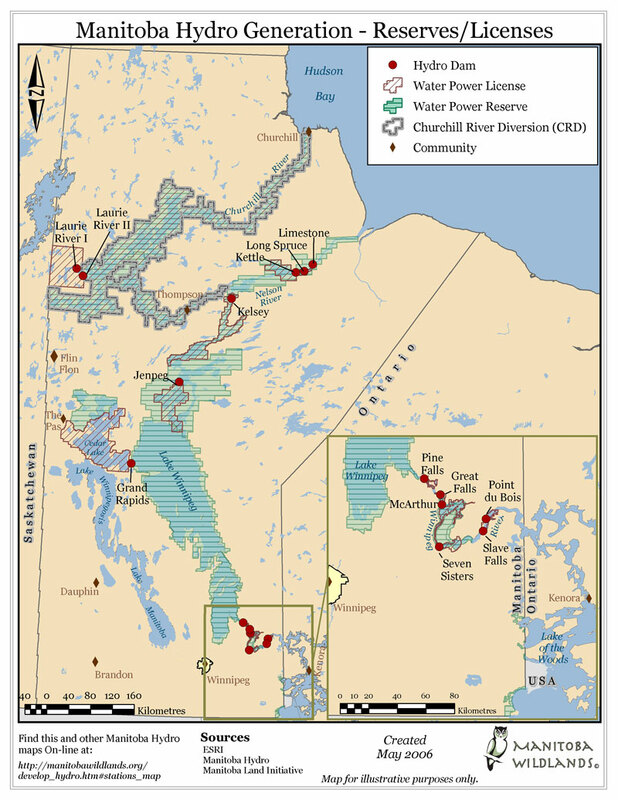 Existing transmission facilitates at Duluth would allow Manitoba-made power into Wisconsin, where Manitoba Hydro also has PPA with Green Bay-based Wisconsin Public Service Corp.
A new law in Wisconsin recognizes large hydroelectric dams, including new dams in Manitoba's north, as a renewable energy source to help meet the state's green-energy mandate. It says by 2015, 10 per cent of all power sold by state utilities must come from a renewable source. Two Global Forest Watch Canada reports, released January 18, 2012, conclude that while hydro electricity releases less carbon than power generated by fossil fuels, emerging research suggests the difference isn't as great as previously thought. The Canadian government, using procedures recommended by the Intergovernmental Panel on Climate Change, estimates that emissions from hydroelectric operations total 0.5 megatonnes of carbon dioxide a year. But, according to the Global Forest Watch report, the real total is between 7 and 13 megatonnes of carbon dioxide per year. Part of the reason for the difference is that government estimates assume spillways and reservoirs stop emitting carbon from submerged plants after about a decade. 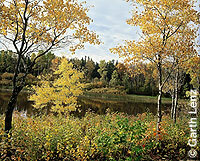 Hydro development releases greenhouse gases when forests and plant materials are submerged by reservoirs. As the organic material decays, the carbon and methane stored in it is released. "The Canadian government ends up with one number and everybody assumes that must be the correct number. The newer literature indicates that net emissions extend way beyond 10 years. The government should update and clean up its reporting of emissions," said Global Forest Watch spokesperson Peter Lee. Lee said correct and complete information is vital as Canadians make decisions about their energy future. The International Hydropower Association (IHA) held its biannual World Congress on Advancing Sustainable Hydropower in Iguaçu, Brazil June 15-17, 2011. Over five hundred participants, including: electric utilities and operators, representatives of social and environmental non-governmental organizations (NGOs), indigenous communities, multilateral finance institutions, and research centres, from 71 countries participated in the Congress. The event included launch of the Hydropower Sustainability Assessment Protocol. The protocol is a tool that allows all those involved in planning and building of a hydropower plant to assess its impact and minimise the detrimental effects at all points in the process. "Dam building is a complex process. It affects communities, ecosystems and economies, and often pits their interests against one another. With pressure to create safe, low-carbon energy sources, we can expect dramatic expansion of hydropower. But we can mitigate the conflicts if we thoughtfully and thoroughly assess potential environmental, economic and social impacts," said WWF Water Security Leader Dr Joerg Hartmann. The Protocol is the result of intensive work from 2008 to 2010 by the Hydropower Sustainability Assessment Forum, a multi-stakeholder body with representatives from: social and environmental NGOs (Oxfam, The Nature Conservancy, Transparency International, WWF), governments (China, Germany, Iceland, Norway, Zambia), commercial and development banks (Equator Principles Financial Institutions Group, The World Bank), and the hydropower sector, represented by IHA. Under the Protocol, projects would be ranked on a scale of one to five according to their likely effects on biodiversity, ecology, hydrology and erosion as well as on broader issues regarding regional planning, cultural heritage and effect on local inhabitants. The protocol, which is voluntary, has faced some criticism because a poor rating may not prevent a project from going ahead. "WWF is committed to supporting this process and making sure that assessments are reliable, that the tool is used for sustainability assessments and not for greenwashing, and that no claims as to the sustainability of projects are made that can't be backed up," Dr Hartmann said. Michael Lawrenchuk, a former Chief of Fox Lake Cree Nation - which has been significantly affected by hydroelectric developments in Manitoba's North - received a standing ovation following his speech at the Congress which outlined his peoples history with Manitoba Hydro. Manitoba Hydro is a signatory to the Hydropower Sustainability Assessment Protocol, and member of the IHA. 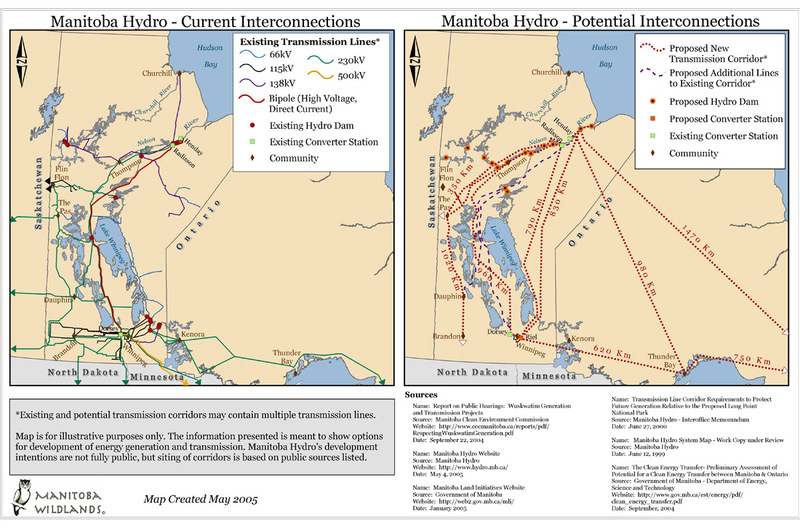 A report commissioned by Manitoba Hydro, Potential Use of Submarine or Underground Cables for Long Distance Electricity Transmission in Manitoba, has determined that if a fourth bipole is constructed, an underground and/or underwater cable may be viable option if a fourth Bipole is constructed, depending in part on technological advancements, further research, and adaptation to Manitoba Hydro's current system. With current technology an overhead line remains the best option, added the report. 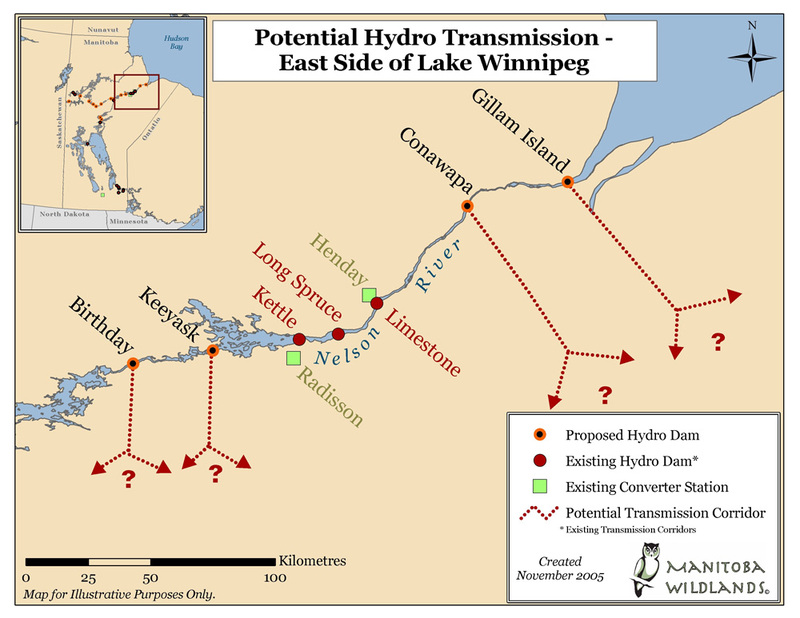 Manitoba Hydro spokesman Glenn Schneider said the report should put the idea of an underwater transmission cable to rest for the foreseeable future. This misstatement of the report's findings, that the underwater/underground cable issue was dead, raised the ire of study co-author Dr. John Ryan. "I can say categorically that our report did nothing of the kind. Unfortunately, for some inexplicable reason, it is Manitoba Hydro's public relations department that contributed to this misconception," stated Ryan, a long-time proponent of an underwater and/or underground electrical transmission. "Moreover, if an overhead line were to be built for Bipole IV, it would probably have to be placed right along the Saskatchewan border, making it so long and costly that an underwater cable route could be competitive in cost, especially considering its advantages," added Ryan. Hydro reservoirs are areas of land flooded to retain water for power generation. Reservoirs release green house gases (GHGs) methane and CO2 for up to 10 years after initial flooding. High waters, changes in generation output, erosion during operation also cause emissions. Emissions are created when organic matter (such as trees and plant material, soils) nutrients are broken down and decomposed by bacterial activity. GHG emissions in reservoirs are the same everywhere in the world but the magnitude varies. Areas of high agricultural activity such as southern Manitoba and Ontario have higher emissions compared to lower productivity areas. GHG emissions from hydro reservoirs are 35-70 times lower per Terrawatt hour than those of thermal generating stations (coal, natural gas). In a Climate Registry seminar in September, 2009 Manitoba Hydro indicated they are using the Inter-governmental Panel on Climate Change approach that accounts for GHG implications at a national level, rather than for individual projects. This approach would not provide information for new generation projects and reservoirs, or emissions during construction or initial years of operation. This approach also does not include land-use change implications, tends to over-estimate methane emissions, but does not fully account full life cycle accounting for all the potential emissions, to include net implications and so is not accurate. Emissions accounting for construction and operation of generation stations needs to be included with reservoir emissions accounting. The World Commission on Dams (WCD) was an independent, international, multi-stakeholder process, which addressed controversial issues associated with large dams. It provided a unique opportunity to bring into focus many assumptions and modes of thinking at the centre of the search to reconcile economic growth, social equity, environmental conservation and political participation in these decisions. As part of its process, the WCD commissioned numerous contributing papers that formed the basis of its November 2000 final report, Dams and Development: A New Framework for Decision-Making. 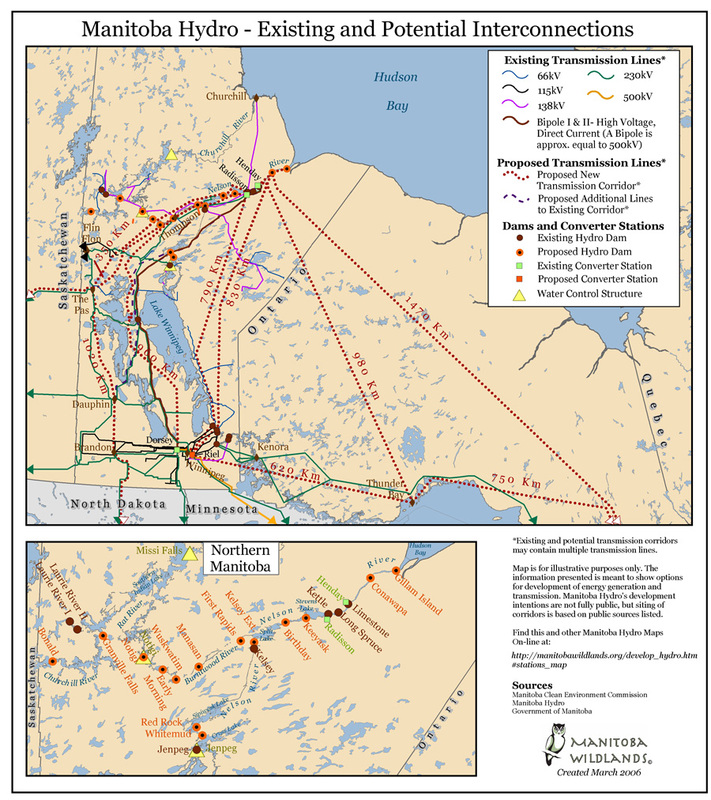 One of the 126 contributing papers summarizes the social impacts of the construction and operation of the Churchill-Nelson River Diversion project on First Nations communities in northern Manitoba, beginning in the 1970s. The WCD completed its work with the launch of its final report in late 2000 and was subsequently disbanded. As a follow-up to the WCD, the United Nations Environment Programme (UNEP) launched the Dams and Development Project. The Low Impact Hydropower Institute (LIHI) is a US-based non-profit organization dedicated to reducing impacts of hydropower generation through certification of hydropower projects that avoid or reduce their environmental impacts based on the Low Impact Hydropower Institute's criteria. LIHI's mission is to reduce impacts of hydropower dams through market incentives. LIHI does this through its Hydropower Certification Program, a voluntary certification program designed to help identify and reward hydropower dams that minimize their environmental impacts. Just as an organic label can help consumers choose foods and farming practices they want to support, the LIHI certification program helps energy consumers choose energy and hydropower practices they want to support. As of September 2009 none of the dams in Manitoba are certified by the Institute. 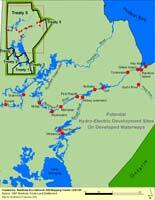 Visit EnergyManitoba.org for more information regarding Wuskwatim projects, hydro power and energy issues in Manitoba. 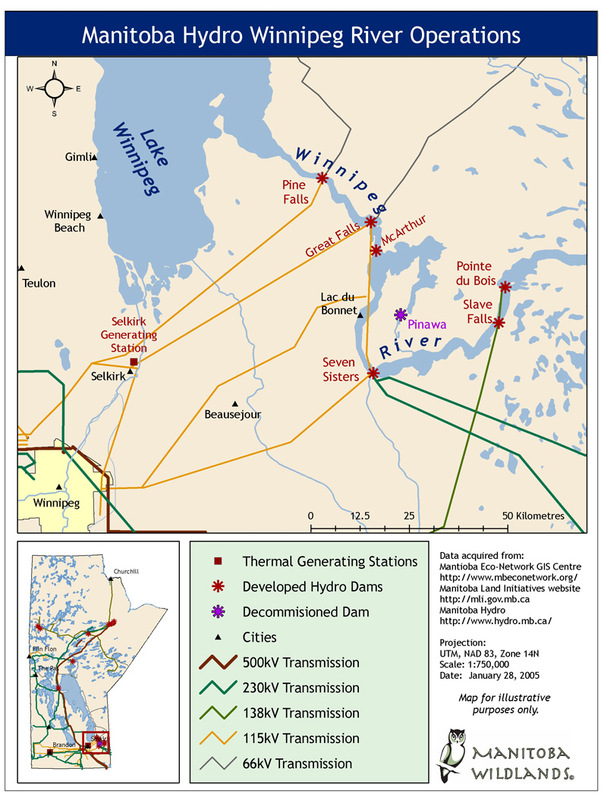 The April 2, 2007 Globe and Mail article (Natives hold key to Ontario power - A proposed east-west energy grid can't proceed without their support) painted only a partial picture of the issues associated with the proposed transmission of hydroelectric energy from Manitoba to Ontario, by omitting some issues and downplaying others. Funding is a major factor in the decision to proceed with the proposed 'east-west grid'. Ms. Howlett correctly points out that Ontario's share of the EcoTrust Fund is $586-million. It is unclear what portion of this amount would be applied to the east west grid. Manitoba has also committed to applying part of its $54 million share of EcoTrust funds. It is only later in the article that a figure of $1.5 billion is quoted for the Far-North Route option. We would caution against the possibility of creating confusion as a result of referring to the 'east-west grid' as only the transmission options for Conawapa to provide power to Ontario. 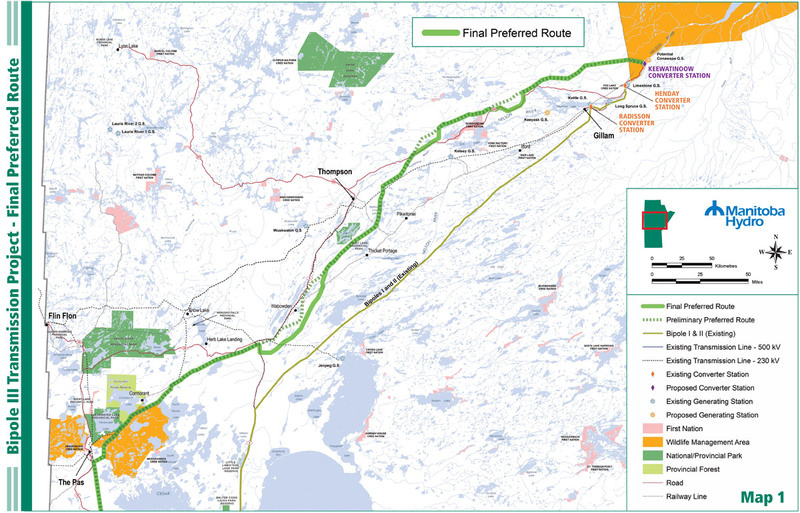 The 'east west grid', while still ambiguous, potentially refers to a transmission system across Canada's north that could connect as many as four provinces. Transmission lines for a future Conawap may or may not be part of the east west grid, depending on routing. 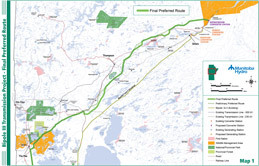 The Globe & Mail article also alludes to the question of transmission line ownership, noting that a group called the First Nations Energy Alliance, representing communities near Timmins and Thunder Bay has been established to explore the possibility of equity partnership in the transmission line. In Manitoba, this issue has already been explored in the context of both the Wuskwatim Generation and Transmission project and also as part of discussions regarding Bipole III, a direct current transmission line option with various location options. 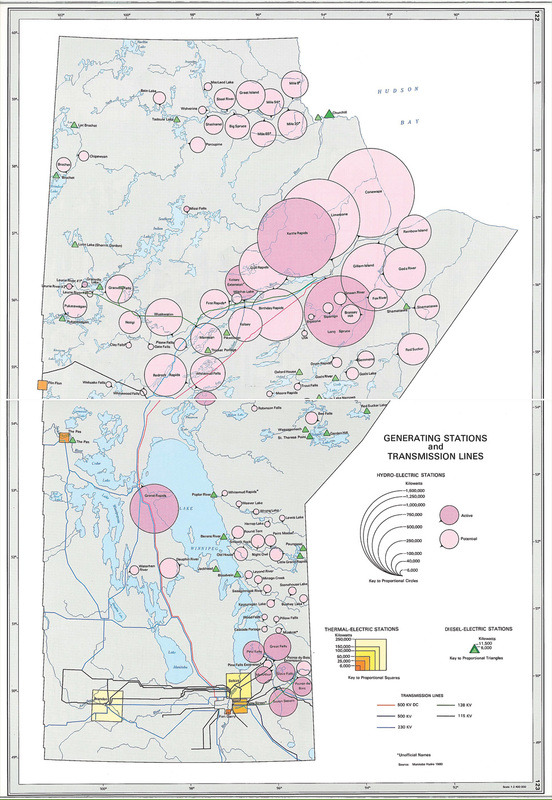 . .
View the Manitoba Hydro - Current & Potential Interconnections Map By Manitoba Wildlands. 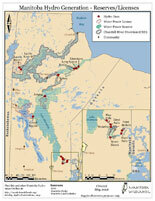 View the Potential Hydro Transmission - East Side of Lake Winnipeg Map By Manitoba Wildlands. By Hobbs & Associates Inc.